Emma and Hook have timey-wimey adventures while trying to avoid changing the future. The latest member of the Charming family has arrived and is waiting for a name. Love takes a killing blow and there's a new kid in town. Hook and Emma's Back To The Future style faffing about to ensure her parents meet and fall in love seems in retrospect to be mainly filler for the episode which ends in them returning to present day Storybrooke with the woman they accidentally saved. That she is Robin Hood's dead wife Marian is likely to test the bounds of Regina's newly found goodness. In the last seconds of the episode, we see that an urn. Which came back through the time portal with them has spilled it's magic contents which coalesce into... Elsa from Frozen, who we only see from behind as she walks out of the barn. I never expected to get stuck on this dorky show but after last nights ep I really wanted to see if any other mefites are watching. I am kinda surprised with the quality of the show and enjoy that it's a women led action story. I am in bits for poor Regina, I shouted "nooooo" at the telly and was shocked and unspoiled. That was GOT level gut-punching. You should know I have fabulous suspension of disbelief skills and rarely see twists coming. It makes me cheap to entertain. With regards to Elsa, that was also a big surprise for me, I roll spoiler free, and I think this is the first "original" character we've seen? I mean I know we have Ariel and Mulan, but these are both from pre-existing literature. I have seen speculation that Kristen Bell may play Elsa, but I am assuming that is pure fanwankery. Few of the other players are well known so I assume the mysterious shot-from-behind angle is because the actress hasn't been cast? That said, there's a number of big-name actors involved in the show, so it's not out of the question. With regards to Elsa, that was also a big surprise for me, I roll spoiler free, and I think this is the first "original" character we've seen? I mean I know we have Ariel and Mulan, but these are both from pre-existing literature. I have seen speculation that Kristen Bell may play Elsa, but I am assuming that is pure fanwankery. Few of the other players are well known so I assume the mysterious shot-from-behind angle is because the actress hasn't been cast? I suspect it'll end up being less "Elsa from Frozen" and more "Ice Queen," which is a generic enough fairytale villainess over the years that they'll be able to do whatever they want with her without feeling any sense of loyalty to the franchise. And yeah, the shot-from-behind was definitely because they haven't firmly cast her yet. I love this show (and enjoyed the Wonderland spin-off, thought maybe Jafar would be the bottle-villain). The Maid Marion reveal strains the continuity for me, only because I can't see how Robin wouldn't have known The Evil Queen was responsible for her death, but I can't see how he would ever have fallen in love with Regina knowing she'd had Marion executed. I really enjoyed the episode, though I think that Regina being sad next season will be much more interesting than Regina being evil (again). I'm going to try to ignore the issue of characters aging or not aging, and hope they discuss how 30 years (which I think they claimed once?) that Robin Hood lived but not Marian will have changed their relationship significantly. 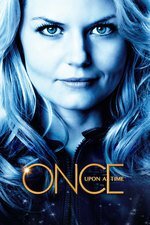 You can see that OUAT is a direct descendant of Lost, mostly in good ways -- they've closed up the story and started a new one a few times, instead of trying to add onto the current story. I look forward to hearing about the casting. I do wish they'd done anything at all with the occasional non-white character they've had -- Lancelot, Mulan, Ariel -- and now perhaps more with Marian. I suspect it'll end up being less "Elsa from Frozen" and more "Ice Queen,"
Newp, I was wrong. They've confirmed that it's Elsa Actual, and that we might see other characters from Frozen. It actually seems from a quick google that it's straight up Elsa from Frozen(TM). ABC is a Disney company and they used #frozen in their advertising for the episode. Hmm, that is a good point about Robin.. I wonder how they can work that? Doh, page didn't refresh, sorry to repeat you! Yeah, they've had some great characters of colour who just evaporated. Re. Mulan, was it only my rainbow tinted glasses that had her about to declare her love to Aurora (not Phillip)? I'm pretty sure we were supposed to read that into Mulan, yeah. It would be great if we got that for Elsa who had better not be Yet Another Evil Queen or in any way related to any of the current characters, because those have been overused in this show. I will watch this dumb show and buy my kid the mickey mouse she keeps begging for if they do Elsa/Mulan. I mean dumb affectionately. OUAT is just so silly plotwise, and yet fun to watch. I haven't seen Frozen, so I had no idea who that was at the end. I guess I will have to watch Frozen before next season. Could someone explain to me what happened with Zelena? Are we to understand that she's dead or did she fake die like she did when Dorothy killed her? Also, why did her death (or not) make Emma and Hook travel back in time? I believe Regina said that when Zelena died all of the magic power in her amulet was released, and having no vessel to go back to it just went ahead with the last spell she'd been doing and so opened the time travel portal. And without her there to focus the destination, it went to when. Emma was thinking of. It's been kind of frustrating that all the POC characters so far save for Mulan have been dead and/or evil. Wasn't there going to be a POC Rapunzel? What happened to her? also gunning for my personal headcanon of Jasmine/Puteri Gunung Ledang/Khutulun. POC Rapunzel was in one episode only so far, in their forgotten year. I don't think we've had her in modern-day Storybrook yet.